Nellie Edge is an author, kindergarten teacher-researcher, literacy coach, nationally recognized early literacy presenter, folk musician, and recording artist. While teaching in a bilingual kindergarten in Albuquerque, New Mexico, she discovered the power of developing language and literacy skills through traditional Spanish and English folk songs. Her desire to make learning to read a successful and joyful journey for all children led to the publication of her Nellie Edge Read and Sing Big Books™. 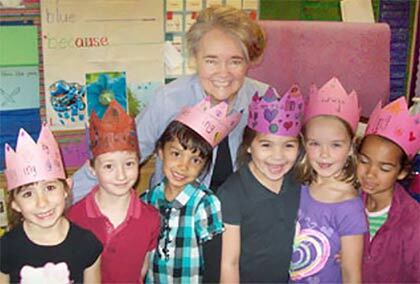 Nellie Edge’s commitment to children and their teachers is evident in her beautiful, highly regarded Excellence in Kindergarten and Early Literacy website, Joyful Pathways blog, and professional resources. A recipient of the IRA Reading Excellence through the Arts award, Nellie Edge is a proponent of using music, American Sign Language, and all of the arts to enhance early literacy skills. She was the founder of the Northwest Coalition for Excellence in Kindergarten Literacy and is a strong advocate for developing professional learning communities for teachers that inspire collaborative inquiry into best teaching practices. Nellie Edge is the author of Kids in the Kitchen, Music is Magic for Your Child and You!, Small Poems of Some Delight, Celebrate Language and Accelerate Literacy: High Expectations • Joyful Learning • Proven Strategies, Parents as Partners in Kindergarten and Early Literacy, The Magic of Signing Songs: Enhancing All Children’s Language and Literacy, and many other titles. She recorded the bestselling CD, Music is Magic, with Tom Hunter. Her latest children’s book and CD is ABC Phonics: Sing, Sign, and Read! from Sign2Me publishers. Nellie recorded the popular Sing, Sign, Spell & Read! CD and program with her daughter Gina Edge. 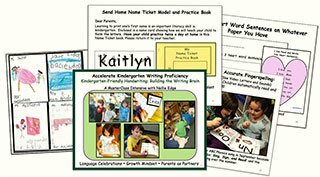 Her current teacher-researcher projects for online seminars include teaching high-frequency “heart words” and the Kindergarten-Friendly Handwriting, Phonics, and Word Work program. Nellie Edge’s literacy seminars and online resources provide models of meaning-centered instruction within a joyful community of learners. She skillfully articulates the research base and our wisdom of practice with multisensory and engaging strategies that build reading independence and foster positive attitudes about learning. Nellie Edge seminars and keynote presentations have inspired thousands of educators nationwide to celebrate language and accelerate literacy by taking advantage of how the young child’s brain learns best. See our daughter Gina's song video from England.